This paper covers several NFV-related topics of keen interest to MSOs. First, an overview of the NFV concept and a look at NFV adoption trends across the telecommunications industry is provided. Next, the implications of combining IP and virtualization technologies for the evolution of networks and services in residential and commercial markets are examined. 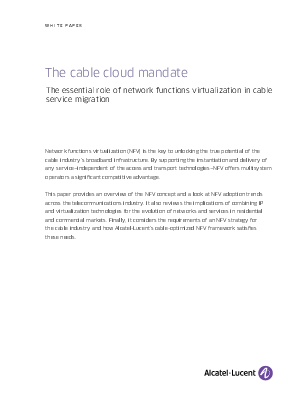 Last, the formulation of a NFV strategy for the cable industry is proposed and an overview of the cable-optimized NFV framework developed by Alcatel-Lucent is discussed.